The Gtechniq MF4 Diamond Sandwich Microfibre Drying Towel helps you remove standing water from the surface of your vehicle safely and easily! If you allow water to sit and dry on the surface of your vehicle, you can be asking for trouble. The minerals in the water, once dry, can actually etch into the surface, causing ugly water marks and once they etch into the surface, you will have to use a water spot remover, or actually polish away the imperfections to remove them. But this can all be avoided with a little time and a high-quality drying towel like the MF4! With its high polyamide content and highly durable construction, the MF4 will help quickly absorb standing water from the surface. The perforated design features two layers, a top layer to help wick water away, and an interior reservoir to help soak up and trap large amounts of moisture. If you have used other drying towels, you know that they can become heavy and hard to really wring out during use. With the MF4 that will not be an issue, just give it a few twists to remove soaked up water from the drying process and it easily releases it. 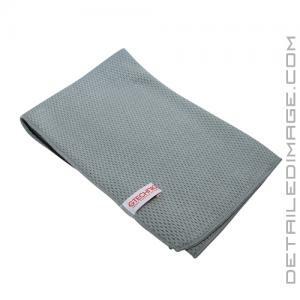 Upgrade your drying towel today with the Gtechniq MF4 Diamond Sandwich Microfibre Drying Towel! Gtechniq MF4 Diamond Sandwich Microfibre Drying Towel offers a significantly higher absorption rate compared to standard microfibre drying towels or chamois leather drying cloths. Combined with its ultra-soft, high polyamide content (30%) top layer and highly durable construction, the MF4 is the pinnacle in drying technology. You will not be disappointed with this towel. I have a Infiniti q50s and one of these towels gets the job done beautifully and safely. Highly recommend. I use the Gtechniq MF4 with the MF2. The MF4 is a fantastic towel that absorbs very well even when it is saturated. I use the MF4 for bulk water absorption, then follow it up with the MF2. The MF4 is very soft, leaves zero lint behind, and is safe on paint. You will probably want a couple of these for your car as one is just not enough. Again, I also recommend using this to get the bulk of the water up then following up with the MF2 towel. The combination is the safest, easiest, and best drying experience you will ever have with a car. Highly recommend the MF4.